Easy Inexpensive Fast How to pack up for shipping a large stretched painting and get also a lightweight package. So you’ve sold a painting, Congratulations! Now you want it shipped to your customer. OK then. Here’s how to get it wrapped fast with easy using inexpensive materials and get a light weight package. This article refers to packing canvas stretched over a wooden frame paintings or pictures painted on board. – extruded polystyrene sheets. They can be 1 or 2 inch thick. 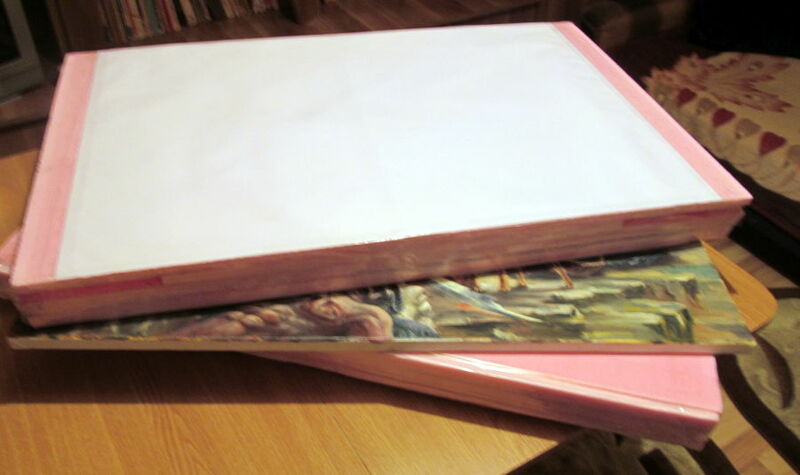 Use 2″ inch thick sheet for large paintings. 1 – Take the painting and wrap it up in cling film . This protect it from scratchings and other possible injuries. Take a polystyrene sheet and lay the painting over it. Draw over with a liner the shape of the painting . Let an extra inch all around the painting shape and cut down the sheets. Now we are basically making a big painting sandwich. The problem with extruded polystyrene and tape is that tape don’t sticks to it. So that we’ll splice the tape getting so the package being reinforced. 3 – Add as much tape as you think it’s necessary. 5 – Add the address label or simply write it by hand. 6 – Ship your painting package to your customer. Ferpect, my dear! 😀 Thank you very much!